Use on fireplaces, wood stoves, brick or concrete. Repairs damaged interior mortar. Withstands temperatures up to 1750 degrees F. Not a fire stop product. 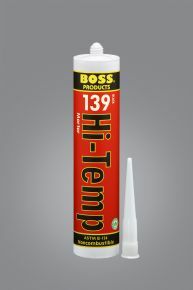 BOSS® 139 Hi-Temp Mortar is a non combustible silicate cement that can withstand extremely high temperatures. Formulated for repairing chimneys, fireplaces and sealing wood-burning stoves and appliances, this product has strong adhesion and sets to become rock hard when fired. BOSS 139 Hi-Temp Mortar cannot be used in areas where there is constant movement, or where wet conditions exist or may occur. BOSS 139 Hi-Temp Mortar has been tested and exceeds ASTM E-136. Can be used in wood frame construction where an ASTM E-136 non combustible sealant is specified and where allowed by the building code. This includes sealing around pipes, ducts, vents and chimneys at ceiling and floor level before drywall is applied.